IF ANYONE ought to appreciate the power of immigration to stimulate employment, it is America's energetic anti-immigration advocates, whose jobs wouldn't exist if it weren't for the influx of immigrants they spend their days seeking to curtail. 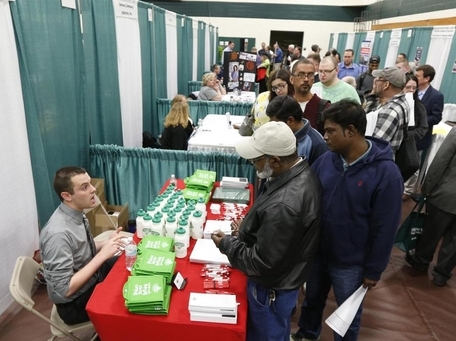 Bryan Preston of Hannaford supermarkets talks with job seekers during a job fair at a community college in Hudson, N.Y.
Then again, appreciating anything about immigration — least of all the ironies of our endless debate on the subject — goes against the restrictionists' grain. Fulminating about immigrants is one of America's enduring pastimes, and it doesn't leave a lot of room for wry humor. Or for logical consistency. Which helps explain why immigrants can be depicted on Mondays, Wednesdays, and Fridays as indolent leeches who flock to the United States to go on welfare — and condemned on Tuesdays, Thursdays, and Saturdays for taking away jobs that would otherwise go to Americans. Last week the Center for Immigration Studies, which favors sharp reductions in immigration, released a report purporting to show that all net jobs created in the United States over the past 14 years have gone to immigrants, both legal and illegal. Using data collected by the Census Bureau, the report's authors, Steven Camarota and Karen Ziegler, note that between 2000 and 2014, the number of working-age native-born Americans with jobs declined by 127,000, while the number of immigrants with jobs climbed by 5.7 million. "This is truly remarkable," Camarota and Ziegler write, "because natives accounted for two-thirds of overall population growth among the working-age population." As a result, the number of US-born natives who don't have jobs — both the unemployed as well as those who have dropped out of the labor force altogether — has swelled by 17 million since 2000. The takeaway? Far more native-born Americans would be working if immigrants hadn't soaked up all the job growth since the turn of the 21st century. But the report's incendiary conclusion — "What employment growth there has been has all gone to immigrants" — doesn't stand up to scrutiny. To begin with, the number of native-born Americans working in 2014 has not declined since 2000. It has increased by 2.6 million. The authors of the report acknowledge as much — in an endnote, on page 17. It is only by excluding the record-high cohort of workers 65 and older, one of the fastest-growing age groups in the labor market, that Camarota and Ziegler can claim that immigrants are taking all the available new jobs. But it is just as plausible to blame the long-term stagnation in the employment of "working-age" American natives on older employees as on those born in other lands. Should senior citizens who wish to work be forced to retire at 65? In the zero-sum world of the anti-immigrant advocates, foreign-born workers can only gain at the expense of the native-born. But in the real world, immigration generally enlarges the economy, boosts productivity, and adds jobs. Immigrants amount to less than 13 percent of the US population. Yet 28 percent of all new American companies launched in 2011, as Rupert Murdoch wrote in a Wall Street Journal essay last month, were founded by immigrants. Broadly speaking, immigrant workers and US-born workers are not substitutes but complements; because they tend to have different skills, they generally don't compete for the same jobs. 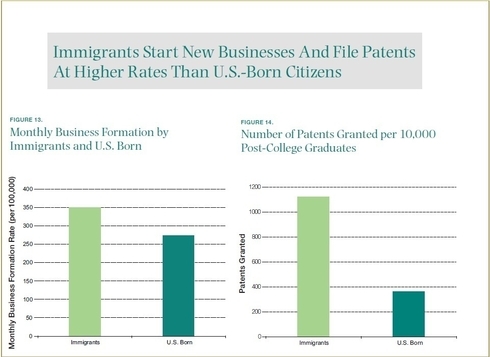 Immigrants are more likely to be employed at the high or low ends of the labor market, explains Alex Nowrasteh of the Cato Institute, while most Americans have skills in the middle. Supplying the immigrant skills needed by the economy simultaneously enlarges demand for native skills. Restrictionists hint at some kind of inverse correlation between gains in employment for US-born and foreign-born workers, but they can't show what doesn't exist. Look past their tendentious presentation of the data, as Nowrasteh wrote about an earlier Center for Immigration Studies report, and you notice that for the most part "net gains in employment for natives and immigrants move in the same direction." When natives gain, immigrants gain, and vice versa. We all work in the same labor market. Which isn't to say that all workers are created equal. Not only are immigrants disproportionately entrepreneurial, they are also more likely to move to wherever work is to be found. Almost by definition, newcomers to the United States are self-selected for mobility and flexibility. Less encumbered by local ties, they're quicker to take advantage of employment opportunities. Their hustle is admirable, not a cause for resentment. Immigrants aren't taking jobs that "belong" to Americans. They are fueling the economic engine that creates more opportunity for everyone, and we would be poorer by far without them.